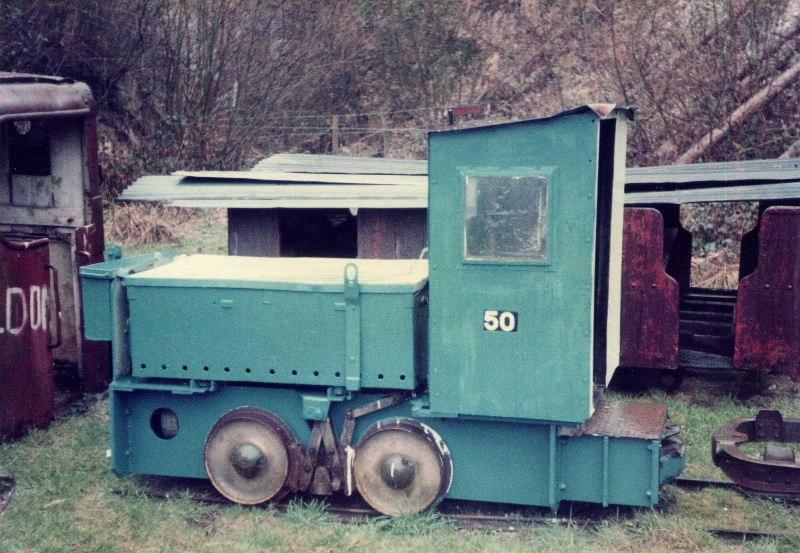 Wingrove & Rogers BEV 5031/1953 was the least viable of the three similar locos in the collection, although arguably the most interesting with its extended footplate and cab, and has therefore been used as a source of spares to keep the other two battery locos in service. Behind can be seen one of the Penrhyn quarrymen's coaches. The heap of rust on the left is the Fowler Resilient, "Peldon". The numbers on the sides of most of the Brockham exhibits were those allocated as a means of identification by the Trust and had no other significance, although some of the numbers did appear in various publications from time to time and have, rather confusingly, been perputuate by some.